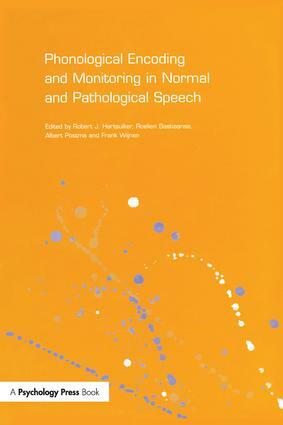 This book reports recent research on mechanisms of normal formulation and control in speaking and in language disorders such as stuttering, aphasia and verbal dyspraxia. The theoretical claim is that such disorders result both from deficits in a component of the language production system and interactions between this component and the system that 'monitors' for errors and undertakes a corrective behaviour. In particular, the book focuses on phonological encoding in speech (the construction of a phonetic plan for utterances), on verbal self-monitoring (checking for correctness and initiating corrective action if necessary), and on interactions between these processes. Bringing together sixteen original chapters by leading international researchers, this volume represents a coherent statement of current thinking in this exciting field. The aim is to show how psycholinguistic models of normal speech processing can be applied to the study of impaired speech production. This book will prove invaluable to any researcher, student or speech therapist looking to bridge the gap between the latest advances in theory and the implications of these advances for language and speech pathology.